Sayyed Hameed Sayyed Mehboob is definitely a criminal with a unique twist. The Hyderabad resident became a real frustration for police officers due to numerous broad-daylight burglaries. Hameed tended to pawn stolen gold at banks in exchange for cash. Police officers raided his home and discovered large quantities of gold and silver, in addition to an 8.32 lakh vehicle. Hameed revealed he started stealing to feed his out-of-control gambling habit. Combined with his luxury lifestyle he saw no other way out, so he turned to crime. 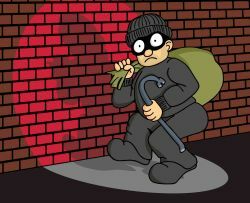 However, Hameed claims to be a charitable burglar as he never sells his stolen goods. By mortgaging them he makes sure that they remain in their original state. According to police reports, Hameed only needed 15 minutes at best to steal gold and other valuable items. The sophisticated thief always seized his chance in the middle of the day. Hameed swore he had given up crime, in order to enjoy a peaceful life together with his spouse and kids. However, he turned out to be a backslider after he started stealing again. Hyderabad Police arrested Hameed after someone had recognized his vehicle. Investigators managed to collect the majority of the stolen items from several finance companies. In addition, the Indian gambler had also pawned stolen gold at jewelry stores. The father of three mortgaged and pawned his stolen goods at multiple venues across several states, including Andhra Pradesh and Maharashtra.